Each year we offer a nice variety of clinics at our ranch. Careful attention is given to the details to ensure that you have a relaxed environment that is conducive to learning. For our all day/intensive clinics, we have meal services to ensure your bellies are full and your mind has the energy to focus! 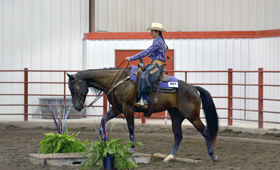 There are stalls or paddocks available for the clinic participant’s horses. A few electric hook ups are available. If you have a group of friends, club or private barn who would like a private clinic, give us a call, we can put together a clinic to fit your individual needs. Happy New Year - Had a great time enjoying the great company and meeting new people! Thanks to those who helped make this a great day. In January look for an article featuring me discussing how to whoa a horse in the January issue of Horse Illustrated Magazine! This is going to be an exciting year for us with the variety of clinics we have to offer. Take a look and give us a call if you have any questions, or inquire about group discounts. Cripple Creek Ranch 2017 Clinic Registration Form Download Form Please fill out one application for each participant and register early to a reserve a spot. May 20, 2017 - Spring Fling Download Form Short Course of Ground Work and Obstacle Training and using those skills under saddle. This is a great way to tune up your horse that has been hanging out in the pasture all winter or taking a break from riding. You get a great opportunity to get your horse off your property, enjoy some training and focus and have fun at the same time. Meet new friends and learn new skills. Great stepping stone to our other clinics. June 2,3,4 2017 - Cowboy & Cowgirl Adventure Clinic Download Form Info to follow. Check back soon. June 4, 2017 - Introduction to Cattle Clinic Download Form Get a chance to warm up your horse then introduce them to cattle in a non-threatening manner. You will get some insight into reading a horse and cow’s body language and how they relate to one another. This is a great opportunity to get your horses used to cattle or over the fear of them. We take a soft, easy approach to getting you and your horse used to being around cattle. We take the time needed to build confidence and knowledge you need to be safe and secure around the cattle. We work as a group and in small teams to establish a connection with the horse/rider and cows. Group exercises to warm up and ensure focus and rider’s abilities to handle the maneuvers necessary to guide a horse around the cattle. We find that working our horses around cattle improves their mental focus and relationship to the rider’s cues. This is not a wild and crazy – chase the cattle clinic. This is designed to create a learning environment to increase your awareness and knowledge and to build confidence for horse and rider. July 16, 2017 - Barrel and Pole- Gaming Clinic Download Form We take into account that all riders are at different levels and we work hard to maximize your time and effort in helping your advance your skills and your horse’s ability to work the events. We start off with some group work and warm up exercises. Then we advance through various gaming events and pick them apart to help you understand how to be efficient and timely as a rider. This is a very motivational clinic and a great way to get a leg up on the competition! July 23, 2017 - Introduction to Western Dressage Download Form I really enjoy teaching this clinic. The riders are very motivated to learn more and eager to work hard and build new skills. We work on various gymnastic exercise and patterns to help you get ready to show or simply ride with a higher awareness. Lovely clinic for those who like details or want to know more about the horse and rider relationship. We will discuss what the judges are looking for in western dressage and what is needed to show. August 11,12,13 2017 - Cowboy & Cowgirl Adventure Clinic Download Form Info to follow. Check back soon. October 6,7,8 2017 - CSany Collier / Barbra Schulte Clinic Download Form Info to follow. Check back soon. or one that you have not ridden or ridden much? Nervous about starting alone and would like some assistance. 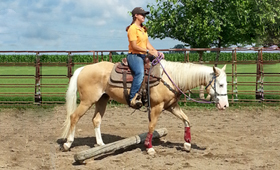 Do you want to take some steps to getting your young horse a solid foundation? Then here is your chance. 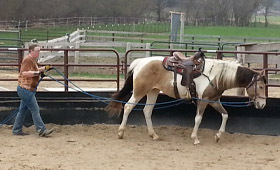 We have a series of four sessions and we will help you work with your horse. Each participant will get individualize attention and the opportunity to learn from each other along the way. The clinic is one afternoon/evening a week with the opportunity for further instruction in between the sessions. 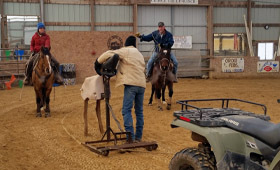 Horses can be brought in for each session or if you are looking for further instruction or opportunity to ride at the facility, the horse can be boarded for that time period. April 24, 2015 - Equine First Aid Clinic Download Form Taught by Dr. R. Joe Peabody DVM, owner of Lake Geneva Veterinary Clinic with Dr. Joe Peabody DVM and Christy Bourbonnais. Be prepared to handle emergency equine first aid situations and learn how to assess, and begin to assist the equine until a veterinarian arrives. This is a Friday evening clinic. Designed to help you know how to assess an emergency, get the pertinent information your veterinarian will need to triage your horse until your vet arrives. The clinic will cover wrapping, bandaging, use of a stethascope for heart and respiratory rates as well as learning about gut sounds. You will learn to take a pulse and more. First aid kits will be available for purchase or pre-order yours when registering. May 16, 2015 - Softness of Motion Clinic Download Form This is a fun clinic. We are looking at the details of your equitation, horsemanship and overall movements. We work as a group and as individual riders. Goal is to develop better timing, feel and understanding of how our horse moves and deeper connection with our cues. Great clinic for those who are looking to advance themselves, new challenges for those who would like to work on some gymnastic exercises with their horse. May 31, 2015 - Introduction to Roping Basics Download Form Learn the parts of the loop, swing, delivery, slack management and dally. Be sure to get your swing down correctly and efficiently. This clinic is started from the ground. You will get a chance to get started without having to manage the horse. This is a great beginner’s clinic as well as for those who are newer to roping and not catching as many as you would like. 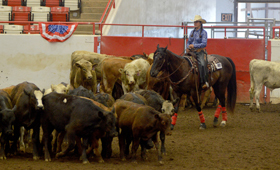 This is a must clinic for new ropers – team, break away, or ranch roping. We will discuss the differences in ropes and what is needed for each event. Spread the word to your High School Rodeo or Little Britches participants! June 28, 2015 June 28, 2015 - “You- According to the Horse” Clinic Download Form This clinic really looks at your relationship with your horse, with yourself and with the world around you. We take an introspective approach and see what we find. This is a clinic of self-examination and awareness. A great time to analyze what you are doing in your life and how you can make changes to facilitate the direction you wish to pursue. This is for positive awareness and discovering how you can become the person you want to be. This clinic provides a great deal of info gathered from your horses mind and eye. I love this clinic and find it very insightful! A friendly way to have your horse show you more about yourself! 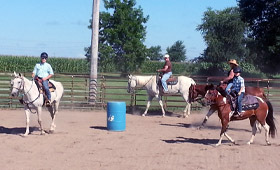 July 26, 2015 - Mounted Shooter’s Clinic for Beginners Download Form Here is a chance to learn about the sport of mounted shooting, assist your horse with handling the noise of the gun shots, and getting the rider familiar with handling their gun. We will do individual work with gun basics. Horses will be exposed to the noise of shooting in a non-threatening manner. We will introduce pattern work, rate, turn, while handling a gun safely. August 9, 2015 - Ranch Party Download Form Ride and dine. Come when you can and leave when you have too! We will ride and hang out in the arena having some games and mock shows! No show attire necessary. Just bring your horse and a smile on your face! Bring a dish to pass and your beverage for after riding, all the wranglers will be hungry so well have a feast together! August 16, 2015 Ranch Versatility Clinic Download Form We will go over the different classes and what is expected in them. We discuss the rules and judging of the class. We will work on some of the skills needed for each class as well as work on group and small team exercises to help establish some of the learning goals. We will have some time working on cattle classes and building cohesiveness as a team. This clinic is best suited for someone who has already exposed their horse to cattle or taken our Introduction to Cattle Clinic. Christy Bourbonnais is the owner/operator of Cripple Creek Ranch. 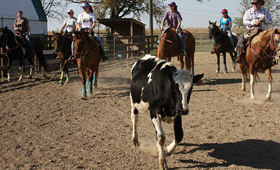 Cripple Creek Ranch is a professional training and boarding facility that offers boarding, lessons, training, equine rehabilitation and clinics. 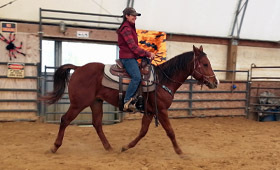 She teaches Western riding lessons (with a bit of Dressage & Vaquero combined) mixed with old time cowboy/cowgirl wisdom, new age technology, holistic elements and natural horsemanship rolled into one package! She has learned from many in the horse industry including Ray Hunt, Martha Josey, Bryan Neubert, Buster McLaury, Craig Cameron, Richard Shrake, Charymane James and many more. She has taken what she has learned and combined it with her experiences and created an approach to working with horses and students in an easy, effective manner. Her style is soft yet gritty enough to get the job done, and not only develops the minds of the horse, but also looks at developing the character of the rider. 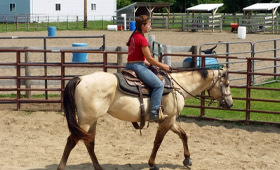 She loves working with young students who would like to advance and gain equine scholarships. She has worked with various veterinarians and uses what she has learned to help rehab a horse back to health using many modern technologies and old school medicines. Christy has joined forces with Dr. Joe Peabody, DVM of Lake Geneva Veterinary Clinic and the two have created a unique equine program of feeding, rehab work, horse training and winning! 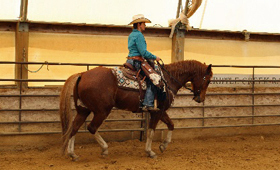 They start about 15 to 20 colts a year and take in a variety of horses for training and showing. 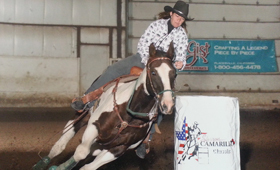 Christy ropes, barrel races, pole bends, and shows ranch horse classes. 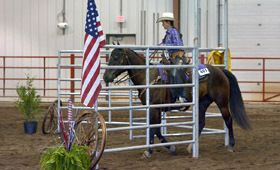 Dr Peabody, DVM ropes, runs cattle and shows in ranch horse classes. 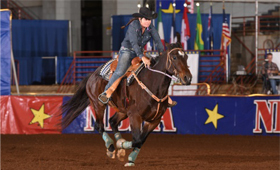 On top of it all, Christy is certified in Western Dressage and is an prestigious AQHA Professional Horseman. 4:30 - 5:30 Tour with Ground Work Demonstration and Veterinary Rehabilitation Demonstration.